Fellow former biathlete Tora Berger is his sister. Berger's family moved to Lesja, Oppland, in 1985. At the age of six, Berger started cross-country skiing, but during his teens he decided to try out biathlon. Tora Berger is a retired Norwegian biathlete and Olympic champion. Lesja is a municipality in Oppland county, Norway. It is part of the traditional region of Gudbrandsdal. The administrative centre of the municipality is the village of Lesja. 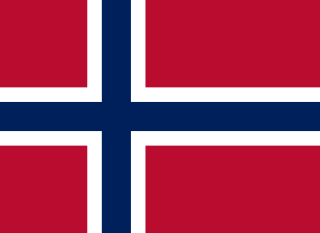 Oppland[²ɔplɑn](listen) is a county in Norway, bordering Trøndelag, Møre og Romsdal, Sogn og Fjordane, Buskerud, Akershus, Oslo and Hedmark. The county administration is in Lillehammer. 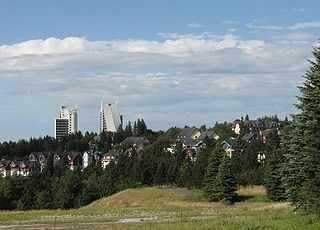 Oppland is, together with Hedmark, one of the only two landlocked counties of Norway. The first Biathlon World Championships (BWCH) was held in 1958, with individual and team contests for men. The number of events has grown significantly over the years. Beginning in 1984, women biathletes had their own World Championships, and finally, from 1989, both genders have been participating in joint BWCHs. In 1978 the development was enhanced by the change from the large army rifle calibre to a small bore rifle, while the range to the target was reduced from 150 to 50 meters. Oberhof is a town in the Schmalkalden-Meiningen district of Thuringia, Germany. It is a winter sports center and health resort. With 1,625 inhabitants, it is visited by 144,000 tourists every year (2016). The town got its official city status in 1985. The 41st Biathlon World Championships were held in 2007 for the fourth time in Antholz-Anterselva, Italy from February 2 to February 11. Molde is a city and municipality in Romsdal in Møre og Romsdal county, Norway. The municipality is located on the Romsdal Peninsula, surrounding the Fannefjord and Moldefjord. The city is located on the northern shore of the Romsdalsfjord. Oberstdorf is a municipality and skiing and hiking town in southwest Germany, located in the Allgäu region of the Bavarian Alps. 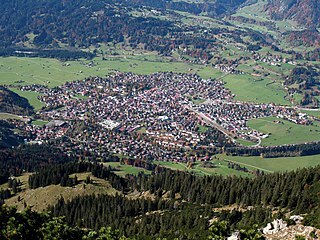 Oberstdorf is one of the highest market towns in Germany. The southernmost point in Germany is located in the municipality and it is the southernmost settlement in both Bavaria, and in Germany overall. Sodankylä is a municipality of Finland. It is located in the region of Lapland, and lies at the northern end of Finnish national road 5. The municipality has a population of 8,435 and covers an area of 12,415.50 square kilometres (4,793.65 sq mi) of which 718.65 km2 (277.47 sq mi) is water. The population density is 0.72 inhabitants per square kilometre (1.9/sq mi). Neighbouring municipalities are Inari, Kemijärvi, Kittilä, Pelkosenniemi, Rovaniemi, and Savukoski. Ole Einar Bjørndalen is a retired Norwegian professional biathlete, often referred to by the nickname, the "King of Biathlon". With 13 Winter Olympic Games medals, he is second on the list of multiple medalists behind Marit Bjørgen who has won 15 medals. He is also the most successful biathlete of all time at the Biathlon World Championships, having won 45 medals, more than double that of any other biathlete except Martin Fourcade. With 95 World Cup wins, Bjørndalen is ranked first all-time for career victories on the Biathlon World Cup tour, more than twice that of anyone else but Fourcade. He has won the Overall World Cup title six times, in 1997–98, in 2002–03, in 2004–05, in 2005–06, in 2007–08 and in 2008–09. Raphaël Poirée is a retired French biathlete who was active from 1995 to 2007. With his 44 World Cup victories and several World Championship medals he ranks among the most successful biathletes ever. Magdalena "Magda" Forsberg is a former Swedish cross-country skier and biathlete. She was the dominating female biathlete from 1997 to 2002, when she retired, winning the Biathlon World Cup for six years straight. She is also a six-times world champion, a two-times Olympic bronze medalist, and holds the record for the most World Cup victories in women's biathlon. Ursula "Uschi" Disl is a German former biathlete. Ricco Groß is a former German biathlete whose exploits made him one of the most successful biathletes of all time at the Winter Olympics and the World Championships. Frode Andresen is a former Norwegian biathlete and cross-country skier. Sergei Vladimirovich Tchepikov is a Russian politician and a former Soviet-Russian biathlete and cross country skier who competed at six Winter Olympics, five in biathlon and one in cross country skiing (1998). His last Olympic performance was a silver medal in the 4 × 7.5 km relay at the 2006 Winter Olympics in Turin. Peter Angerer is a former West German biathlete. Frank Luck is a former German and, before 1990, East German biathlete. Emil Hegle Svendsen is a retired Norwegian biathlete. He has won eight medals at Winter Olympics and five individual gold medals and seven relay gold medals at World Championships. Valeriy Alekseevitch Medvedtsev is a former Russian biathlete. Vladimir Alexandrovich Alikin is a Soviet former biathlete. Egil Gjelland is a former Norwegian biathlete. He is olympic champion in the biathlon relay from the 2002 Winter Olympics in Salt Lake City. Juri Fyodorovich Kashkarov is a former Soviet biathlete. Ekaterina Vinogradova is a Russian-born biathlete and cross-country skier. She competed for Belarus, then for the United States and now competes for Armenia. Christoph "Sumi" Sumann is a former Austrian biathlete. Tarjei Bø is a Norwegian professional biathlete. Bø debuted in the Biathlon World Cup on 26 March 2009 in Khanty-Mansiysk, Russia, and won his first World Cup victory on 10 December 2010. In the 2010 Winter Olympics he earned his first gold medal in the 4 × 7.5 km biathlon relay. On 10 December 2010 he won the sprint race in Hochfilzen, earning his first world cup victory. He also won the following pursuit race and anchored the winning relay team. Bø is the older brother of biathlete Johannes Thingnes Bø. Johannes Thingnes Bø is a Norwegian biathlete. He represents Markane IL and is the younger brother of biathlete Tarjei Bø. Tiril Kampenhaug Eckhoff is a Norwegian biathlete who represents Fossum IF. She is an Olympic champion, winning the Mixed Relay at the 2014 Sochi Winter Olympics, and also won a bronze in the Mass start, a feat she repeated at the 2018 Winter Olympics. Eckhoff is also a two-time gold medallist from the 2016 Biathlon World Championships in Oslo where she won both the relay and an individual gold in the 7.5 sprint. She is the sister of fellow biathlete Stian Eckhoff. ↑ Associated Press (15 January 2011). "Tora Berger wins biathlon sprint in Germany, day after brother Lars wins race". Winnipeg Free Press . Retrieved 25 February 2011. ↑ Tingve, Pål Marius (27 April 2015). "Lars Berger legger opp". Dagbladet (in Norwegian). Retrieved 27 April 2015. 1 2 "Lars Berger". IBU Datacenter. International Biathlon Union. Retrieved 24 June 2015.